In the light of Steve Ballmer retiring from Microsoft, Wozniak thinks his period leading the company wasn’t as significant as that of Bill Gates. “Steve jobs had very strong feelings about what makes a company great, what makes products great. 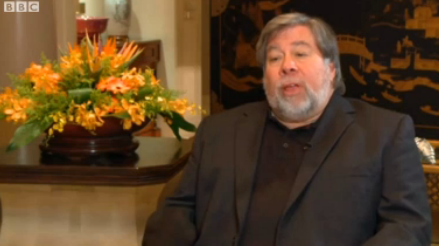 He more-or-less chose Tim Cook to be in that role, in that position,” Mr Wozniak told the BBC’s chief business correspondent Linda Yueh. Woz also shared his thoughts about Samsung, Apple’s biggest competitor, which has recorded an impressive growth lately becoming the world’s No. 1 smartphone manufacturer. He says that while Apple had great products, Samsung has found its way to the emerging market, where Apple is far behind. “Samsung had great marketing prowess,” he said. “They also had distribution channels in so many markets of the world that Apple was not in, because Apple more-or-less grew up under the Macintosh, which had a low world market share. “You are going up against people that already have the connections, the business strategies, the business methodologies of those other parts of the world. “It is going to be a fight for Apple and a worthy fight,” he added. The entire video is worth watching, check it out here.